“Vienna is different”. This slogan, originally coined by an Austrian writer, was taken over in the 1990s by the city’s own tourism board for an ad campaign. More importantly, it’s still being quoted all over the world (seriously, do a Google search), especially so in academic studies about the Viennese housing market. What is so special about the local housing situation? Mostly that there’s still a very strong presence of municipally-owned residential buildings. As of 2011, 42.3% of Vienna’s housing belonged to the “social rental” category, that is, housing owned either by the municipality or by city government-supported limited-profit associations. While not completely unique anymore – in Amsterdam, for instance, 48% of all housing belonged to this category in 2009 – Vienna is still well above the European average. The fact that Vienna is different in this respect is the consequence of a period in the early twentieth century when Vienna became different. It’s history time! As a result, unrest among the population and demands for government action grew. In 1910 and 1911, homeless people and discontented renters started mass protests against the housing situation which were put down violently in some cases. In 1914, the Social Democrats unsuccessfully demanded the introduction of taxes that should be used specifically for building public housing estates. Vienna’s then Christian Social government was generally not interested in developing any kind of regulatory influence in the housing market. It supported some funds and brain trusts that started popping up around 1900 with the goal of remedying the housing crisis, and together with the nascent non-profit building corporations increased the construction of apartments until 1918. The demand for housing couldn’t be satisfied by this, however, especially when World War I brought a whole new wave of immigrants into the city. After the war, the Social Democrats took over city hall in 1919 and immediately started redirecting funds into housing projects. Initially, this included support for the so-called “Settlers’ Movement”, which had its heyday during this time and created new living spaces through squatting in apartments left vacant by the war and especially through erecting garden settlements in Vienna’s border regions. From 1923 onwards, the magistrate shifted its focus towards the construction of large-scale public housing projects. With the period of hyperinflation overcome, it introduced a new “housing tax” which specifically taxed high-cost rental properties. These made up only 0.5% of Vienna’s total rental property, but contributed almost half of the money collected through this tax. More than a third of all tax revenue of the province of Vienna in 1927 came from this housing tax alone. The first target issued by the government in September 1923 was to build 25.000 apartments within five years; having met that goal ahead of time, a new plan of action regarding the construction of 30.000 apartments was released in 1927. In 1926 the city built more than 9.000 flats, compared to less than 3.000 in the period 1920-1923. Most famous among all these new projects were without a doubt the big housing complexes like the still-renowned Karl-Marx-Hof or the more Garden-city-oriented George-Washington-Hof. 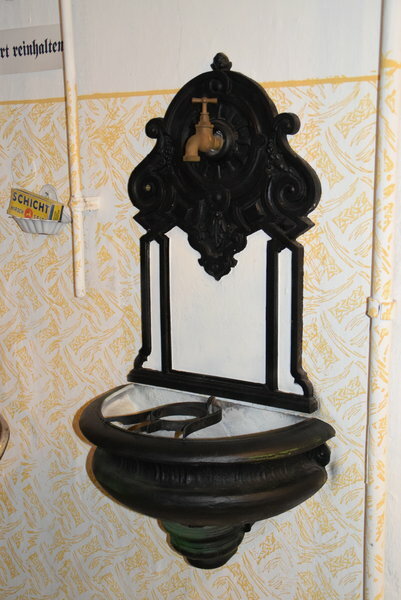 These were intended not only to function as impressive monuments to proletarians, but the communal facilities within them, like kindergartens and laundry rooms, were supposed to help accelerate the “liberation of housewives”. Affordability was paramount, as well. Whereas a worker had had to invest at least 20% of his salary into his rent in the pre-war period, the rent in an apartment within a newly-built estate in 1925 was fixed at a low level and made up only around 4% of a worker’s income (without heating) – hard to imagine nowadays. The apartments themselves also represented clear progress. They were still mostly very small (less than 40m² in area), but had access to running water, a separate kitchen (most kitchens before that time had just been built into a corridor), and windows in each room. Even in the “super blocks” attention was paid to the availability of natural light, a factor that had been disregarded in many older buildings. 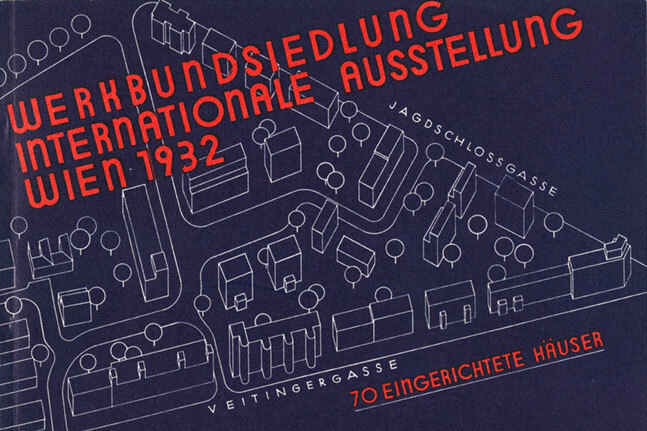 Vienna’s housing projects raised a lot of international eyebrows, and as a consequence an “International Housing and Town Planning Congress” was held in the city in 1926. Aside from admiration there were also various critics of the concepts who regarded the apartments as clearly too small and the “super blocks” as being too densely built. Reacting to that criticism, the city government raised the average size of an apartment in their second building program to 57m² and partially revived the garden city conception for settlement projects at the edge of town (the magistrate didn’t entrust the “settlers” with those projects anymore, though, preferring to control the building process itself). 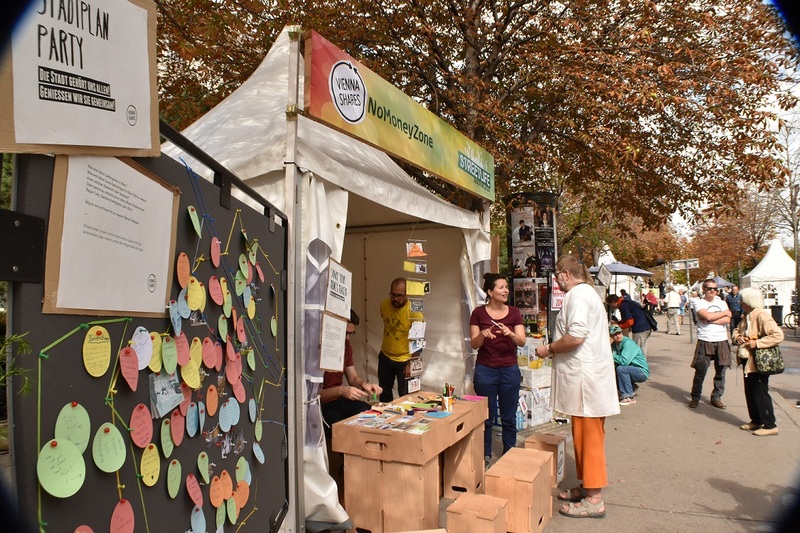 The most famous undertaking of this period is probably the “Werkbundsiedlung” in Hietzing, a settlement consisting of seventy one-family dwellings which was opened to the public in 1932 as a sort of open-air museum that was supposed to show the future of housing. With the financial crisis post-1929, the city had already started to run into financial problems. The fascist takeover of 1933/34 then ended its independent status within Austria and thus the era of “Red Vienna”. Large-scale projects were ended, and new settlements were mostly conceptualized as half-agrarian garden settlements, a process that had already begun in 1932 and was aimed at combating unemployment. When the National Socialists took over in 1938, they re-introduced the focus on large-scale undertakings, wanting to outdo the Social Democrats, but in reality only ever built around 3.000 apartments. Most housing was “provided” through forced ejection of previous inhabitants, above all Jews. The end of World War II brought the Social Democrats back into power. Housing remained a central point on their agenda, this time around heavily determined by circumstances. More than 20 percent of Vienna’s apartments had been damaged or destroyed in the war, and it took around 15 years to remedy that – mostly through the construction of small, cheap apartments within small blocks that had no decoration on the outside whatsoever and were nicknamed “Emmentaler architecture” by the Viennese. The Sixties were to become Vienna’s most active decade in terms of construction: “prefabricated” elements could now be assembled together on site into a multi-storied apartment complex, making construction especially cheap. A new influential paradigm dictated that a city should be divided up into specific zones, one for industry, one for living, one for commerce, etc. As such, the newly built housing complexes were often far away from anything else, resulting amongst other things in a marked increase in traffic – heavy criticism ensued, and the settlements from that time are still known as “sleeping cities” (Schlafstädte), since sleeping seemed to be about the only thing to do there. 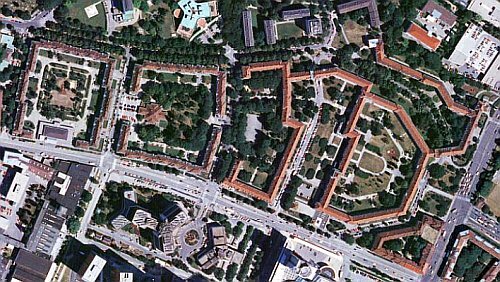 As a consequence, Vienna’s urban planners tried to reintegrate council estates into the city in the 1970s and 1980s. While there were still big projects and they were often still constructed quite far from the city center (think of Alterlaa, Am Schöpfwerk, Wienerberg, Rennbahnweg, for instance), more attention was paid to put them into areas where inhabitants came from mixed socio-economic backgrounds, where workplaces and essential facilities were easy to reach, and in some cases the inhabitants were already included in the planning process. The average size of apartments in these estates had also increased to 80m² by then. Am Schöpfwerk, immortalized in the Austrian comedy classic “Muttertag”. In recent decades, housing construction has diversified a lot; projects inspired by super blocks, garden cities, terrace housing and high-rise architecture and more are part of recent building programs. The city government itself has gradually removed itself as a builder, though. Construction is mostly handled by non-profit or limited-profit associations that are chosen through a competition in the planning phase and subsequently subsidized by the magistrate. These associations own around 140.000 out of Vienna’s more than 800.000 housing units, while the city itself still owns about 220.000. These city-owned or city-subsidized apartments are also usually heavily rent-controlled in order to be affordable to the poorer layers of Viennese society. Experts have warned, however, that these measures are not quite efficient anymore. Average rents in Vienna are rising far faster than average net income, resulting in a struggle for the poorer members of society to find ade-quate housing. In a recent study on the “neo-liberal restructuring of urban housing markets” that compared Vienna to Amsterdam and New York, author Justin Kadi remarked that while the Dutch and Austrian safety nets were better equipped than the American system to provide housing for low-income households, in Vienna especially “newcomers” to the system have recently had more and more problems finding accommodations. 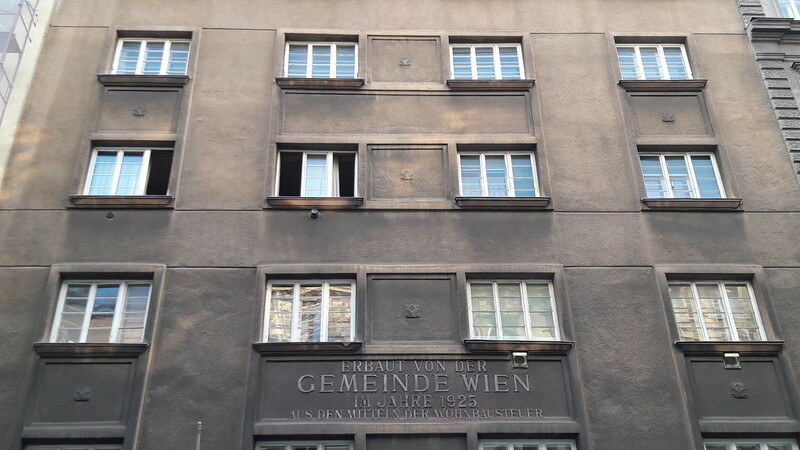 While Red Vienna’s housing heritage is thus not only highly visible and a matter of pride in public discourse, we might have to pay attention that its achievements don’t slip away from us in the near future. 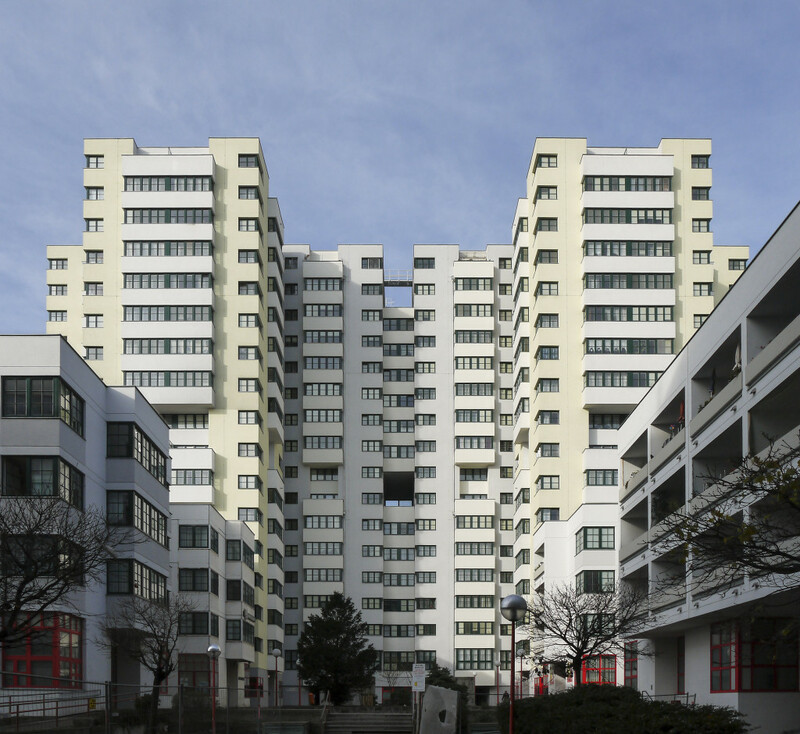 Wolfgang Förster, 80 Years of Social Housing in Vienna. s.d.